Food processors are experts at producing food products, chemical manufacturers are experts at developing chemicals, pharmaceutical companies are experts at making drugs, and pneumatic conveying manufacturers are experts at moving bulk solids. Just as it is not necessary to become an expert on how to build a vehicle when purchasing one, it is also not necessary for users of pneumatic conveyors to become experts at vacuum conveying to incorporate them into their processing line. While it is a good idea to have a broad understanding of how pneumatic conveying systems work, no pneumatic conveyor manufacturer will ever ask a customer if they need a dense phase or a dilute phase system. There are however a host of other questions a conveyor manufacturer will ask about a process, and the materials used in that process, that will aid them in designing a system with the necessary components to provide a solution that integrates into a customer’s process. 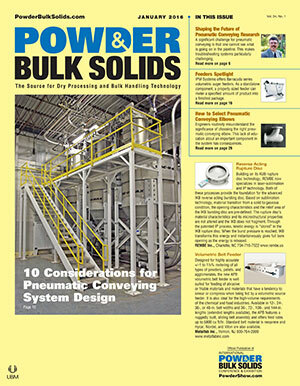 This cover feature article appeared in the January 2016 issue of Powder & Bulk Solids Magazine. To learn more about the following top 10 considerations when designing a pneumatic conveying system for your batch or continuous process, download PDF.